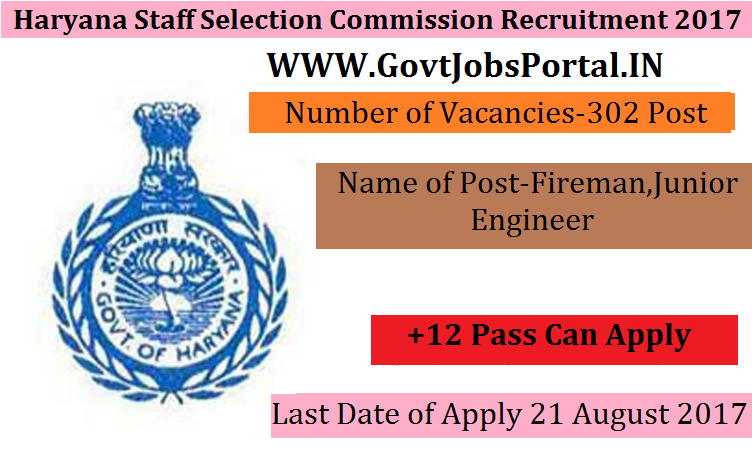 Haryana Staff Selection Commission is going to recruit fresher candidates in India for Fireman, Junior Engineer Posts. So, those candidates who are willing to work with this organization they May apply for this post. Last Date of Apply 21-August-2017. Total numbers of vacancies are 302 Posts. Only those candidates are eligible who have passed Matriculate & basic course in Elementary Fire Fighting from the Haryana State Fire Fighting institute & Diploma in Civil Engineering from an institution recognized by the state Government. Indian citizen having age in between 18 to 42 years can apply for this Haryana Staff Selection Commission Recruitment 2017. Educational Criteria: Only those candidates are eligible who have passed Matriculate & basic course in Elementary Fire Fighting from the Haryana State Fire Fighting institute & Diploma in Civil Engineering from an institution recognized by the state Government.